I have been researching the Crop Circle phenomena since I saw my first one in 1976. I had been on a "night watch" for UFO's on Clay Hill in Warminster. Three separate orbs of approximately six feet in diameter of coloured light had been weaving around and above us for some three hours on the top of Clay Hill, merging at times into a single globe and then separating again above us. Suddenly one of the orbs descended to some thirty feet above us and then flew down into a field at the base of Clay Hill. As dawn broke I noticed a flattened circle in a filed of wheat. On inspection there were no broken stalks just a perfectly flattened circle of some thirty feet in diameter. At that particular point in time I had seen and had knowledge of the famous "Tulley UFO Nests" in 1966 at Australia but had not heard of anything of a similar nature in this country. There then appeared to be a lapse in the appearances of any Crop Circles despite my search and request for any information on them until the early 1980's. In my search and research for them during that period of time I uncovered a mention of them in early French literature (800 AD). The bishop of Lyon at that time had written to the local parish priest who was taking over his parish just outside Lyon. The contents of the manuscript were basically to warn the new priest that there had been "devil worship" by his local parishioners who were collecting seeds out of "flattened circles" and using them for fertility rites. I spoke to quite a few farmers who remembered seeing "odd shapes" in their fields or their parent's fields when they themselves were young but no real proof. I uncovered information from a second world war pilot who had been returning to RAF Tangmeir after an aerial reconnaissance mission over Germany, as he approached the grass runway at his base he saw two flattened circles in the nearby growing cereal crop and photographed them not knowing what they were. I tried in vain to locate these two black and white photographs which the pilot remembered were handed on the aerial reconnaissance film but once again to no avail. The pilot remembers seeing the film with the German aerial photographs and the two Crop Circles on it which were sent to the Air Ministry Intelligence at Whitehall. During the early 1980's there were simple circles appearing in cereal crops ranging in sizes from ten to thirty feet in diameter but as we moved into the latter half of the eighties more complex shapes started to form which generated a lot of media attention. 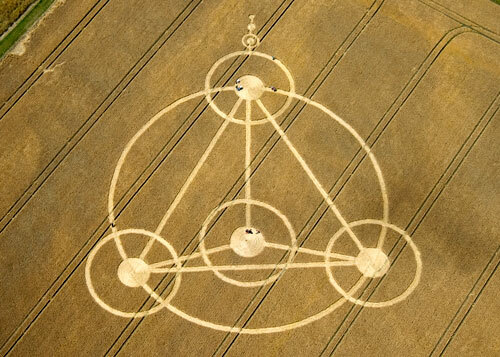 We had a definite evolution happening with the Crop Circle formations or Crop Glyphs as they were called and lots of theories being put forward as to the causes ranging from meteorological effects, military experiments through to UFO's and encounters of the human kind. They were, and do not only appear during the hours of darkness, they wee and still do not only appear in just summer cereal crops, but in grass, stinging nettles, winter crops such as beet and kale, sugar cane, underwater in rice paddy fields in Japan, in the snow 13,000ft up in the mountains in Afghanistan, in fact world wide, not just restricted to southern England as quite a few people believed such as the two famous Doug and Dave. These two hoaxer's had claimed to have made all the crop circles in England since 1980. Little did they know then the extent of the formations. Yes, each year we do have a certain amount of the formations that are man made, this is no dispute with any of the researchers, but this does not account for remaining ones for which there appears to be no logical explanation. With my investigations into the UFO enigma since the 1950's I felt, and still do, that there is a link and in 1981 I started up my own research unit called Crop Phenomena Investigations. Since that period I have been working with several institutes including the famous Dr. William Levengood's laboratory in America. He is a bio-physicist and with his team carry out research on all samples sent to him from around the world that are taken out of Crop Circle Formations including the ones from this country. He has had his research papers published in several scientific journals. Fact: We know from the scientific research that I am involved in that they are (the genuine formations) formed by an energy which has the ability to alter the growth rate and pattern. Fact: The energy involved appears to be benign and to my knowledge is not used on this planet. Fact: Some formations radiates a sound at approximately 5.7hz in the electromagnetic spectrum. Fact: This same frequency has been picked up many times in close proximity to UFO sightings. Fact: Despite several ploughings after the crop has been harvested the shape of the formation has remained in the soil for at least six months afterwards in some cases. This can not be achieved by "Crop formations" made by humans. Fact: In some of the formations, compasses rotate at will denoting a magnetic anomaly present. Fact Crop outside of the formation does not display the same characteristics as the crop found inside. Fact: There is no level of consistency, in some formations we have the sound factor, the magnetic anomalies and the lasting impressions in the soil but this not to say you will find one or all of these in the next formation you visit but it can still turn out to be part of the genuine article. Fact: If no human beings goes into a formation the crop will continue to grow and the farmer will not lose any crop, only possibly what the birds will eat by the downed seeds. Fact: Farmers have combined the formations from their fields to avoid damage by the members of the public when they have occurred only to find another one to appear a short distance away by the following day. So what are we left with? Beautiful geometric patterns in the fields, which defy our laws of logic, physics and reasoning but none the less, they keep appearing world wide. They appear to have a very spiritual, profound effect on all who visit or research them, perhaps if nothing else this is their reason. Like the UFO scenario, there have been cover ups with the Crop Circle Formations, they are a mystery which one day mankind will know, For the truth is out there, if you know where to look.